Snorkeling off Santa Cruz, Channel Islands, California. Loren Klute photos. I took the early morning Amtrak from my home in Orange County, connected at Union Station in Los Angeles and continued on to Ventura. The coastal city lies right where the 101 freeway hits the ocean and then turns north towards Santa Barbara. Upon arrival, I grabbed a prearranged cab ride to the Island Packers headquarters located in Ventura Harbor. Island Packers is the only way out to all five of the Channel Islands of California (minus your own boat). Check-in was quick and easy and thirty minutes later I was aboard the Island Adventure, a two-story catamaran that runs on bio-diesel. The captain came over the loudspeaker with a series of safety instructions, facts, and jokes as we made for the open ocean. On a normal day, one can spot Santa Cruz and the rest of her sister islands, roughly 20 miles distant from the Ventura coast. But the day we left, the horizon was an opaque drabness composed of haze and clouds. 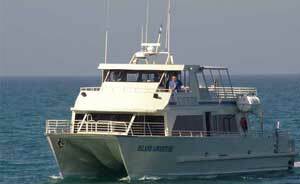 Island Packer's catamaran, the way to get to Santa Cruz Island. The calm of the harbor waters soon gave way to moderate swells, each time the boat crossed a set my stomach sank as a spray of heavy mist scattered to the port and starboard. I alternated between reading and watching a group of foreigners who snapped photos at the bow while leaning perilously over the railing. They failed to list as the captain came on again, making jokes at their expense and a crew member was finally forced out into the wind in order to discourage them from actions that surely would have put them all into the roiling cold water. The further we traveled into the blank horizon, the further the coast at our rear retreated behind the sheen. Next thing I knew the boat had been engulfed on all sides by the dim obscurity of gloom. We could have been lost at sea, a thousand miles from nearest shore. A fox finds dinner in the Channel Islands, California. Minutes later the Island Adventurer made a slight turn in direction to join up with a pod of Common Dolphins. The cetaceans kept pace with the boat as it’s passengers (myself included) excitedly snapped photos. The chance encounter was actually not an aberration but something quite common to Southern California’s coastal waters. Minutes after the dolphin's departure, several half-formed shapes became manifest off the port side. It was Anacapa Island, the first of the Channel archipelago, itself is much smaller than Santa Cruz (96 sq miles compared to 1.1 sq miles) and composed of several small islets. Around the same time, the faint outline of Santa Cruz formed into something tangible to our starboard. Cliffs in Potato Harbor, Santa Cruz. Santa Cruz is a mass of rising cliffs supporting fields of yellow and brown weeds dotted by verdant trees and a backdrop of mountain peaks (the highest at over 2,000 ft). Scorpion Anchorage, our destination, lay in a valley that snakes its way between two ranges of hills and terminates at a beach facing the California coast. All the hills ended in steep cliffs with one to two hundred feet drops to the water below. The cliffs at the water line were dotted with caves only accessible by kayak and the hills above ascended into soft rises. Before disembarking I stole a quick glance at the mainland, it was gone behind the impenetrable veneer. Only an hour’s boat ride and I felt transported to a much more distant place. I found the island to be untouched by man (minus a few exceptions) which proved to be the exact opposite of any coastline in finding along Southern California; no mansions overlooking the water, no bars, no grocery stores, no traffic-clogged superhighways, only a rusted out pier partly covered in guano. The history of the island is a continuation of limited human exposure; the Chumash Indians, cattle ranching and hunt clubs. The names that adorn the island provide a sort of mysterious aura; Scorpion anchorage, Prisoners Harbor, Smugglers Cove. I met my friends a short walk from the pier, they had arrived the day prior. 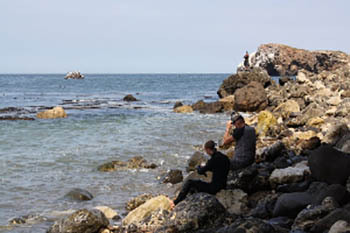 Santa Cruz has two options for camping; Scorpion where we were staying and Prisoner’s Harbor, about ten miles away. Less than twenty-five percent of the island is accessible to the public, the rest being under the ownership of the national Nature Conservancy. The camp grounds at Scorpion Harbor are located in three separate groups about a half mile walk from the beach. We had a late lunch of MREs (Meals Ready to Eat), one of my companion’s idea of a bad joke. The campsite itself was quiet and cool, enclosed by massive eucalyptus trees. 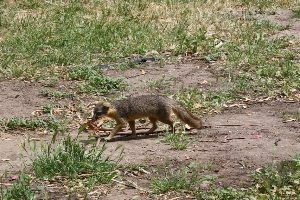 Island foxes ran about the bushes seeking out any scrap left by campers. Each of the Channel Islands has its own subspecies of the diminutive canine. Post lunch we tested the waters at the beach. Two of our group went snorkeling. I went ankle deep before the skin on my feet went numb. I decided to leave the swimming to my friends. Those of us who abandoned the idea of early death from exposure explored the rest of the coast, climbing over an expanse of rocky desolation hemmed in by sheer cliffs and crashing waves. After the beach we decided to embark on a hike north of the campsite. We climbed steep weed covered hills to find spectacular views of Scorpion Harbor, Anacapa and the sea beyond. We continued another four miles on the thin path as the sun began to shed the covering haze. We found ourselves at a crest overlooking Potato Harbor; an abandoned stretch of rocky coast surrounded by precipitous walls of stone and straggly plants. Even though the haze had broken along the island and east into the Pacific, the sky had yet to release its grip on the California coast. Only the faintest outline of Ventura’s hilly horizon was perceptible in the distance. For all we knew we were alone on this desolate rock amid the axis of the unknown. After a dinner of more acceptable camper’s fare, we played cards by the light of a propane lantern and shared bottles of rum and whiskey, each having been transported to the island in water bottles since Island Packers doesn’t allow the transport of glass bottles. The next morning we had a breakfast of bagels and trail mix before packing up the campsite and depositing our bags face down at the pier. New campers were set to arrive and the bags were placed face down at the behest of the rangers who warned against the cunning of crows who had learned the intricate operation of zippers. HIking a windswept hillside in California's Channel Islands. The new trail showed itself to be much more strenuous than the prior day’s from the very onset. Soon however we were in the wilds of the island, detached from the camp grounds and other campers. Our destination was Montannon Ridge, a full eight miles round trip. The hills grew steeper as the fields of yellow gave way to hard red dirt pepper by rugged looking scrubs surrounded by large boulders. Our tired legs received a break as we partook of lunch on the ridge. We sat tiredly chewing on energy bars and gulping water while enjoying panoramic views of the western side of the island. To the east, the mountains and coast disappeared into the forbidden protection of the Conservancy. I wondered at the mystery of the island’s murky past; the deserted villages of the Chumash Indians, the brief population of Mexican prisoners and then the cattle ranches now only evidenced by a few abandoned buildings. I remembered the stories of a friend who had flown to the island when it was under private ownership. His father had prepared custom Jeeps and Ford Broncos for one of the hunt clubs that leased a portion of land from the owners. He participated in the hunt, his prize a feral ram. The last of the feral pigs and sheep had since been removed from the island. Once back at the pier we rested in the shade and watched as a group of crows tore apart a few of bags that had unwisely been placed with their openings exposed. Santa Cruz remains the most widely accessed of all the islands, yet there’s usually no more than a few hundred campers amid one hundred square miles of wilderness. The rest of the islands beckon to be explored. Love California? Get our California Plane Reader with dozens of stories like this for your Kindle, Nook or iPad! Loren Klure is a novice writer and avid traveler. When not traveling he spends his time working as a Mortgage Underwriter in Southern California.